Using the In-flip to build on whole school training in year 2. A new school year has begun and we have entered the second year as a Chromebook 1:1 school. 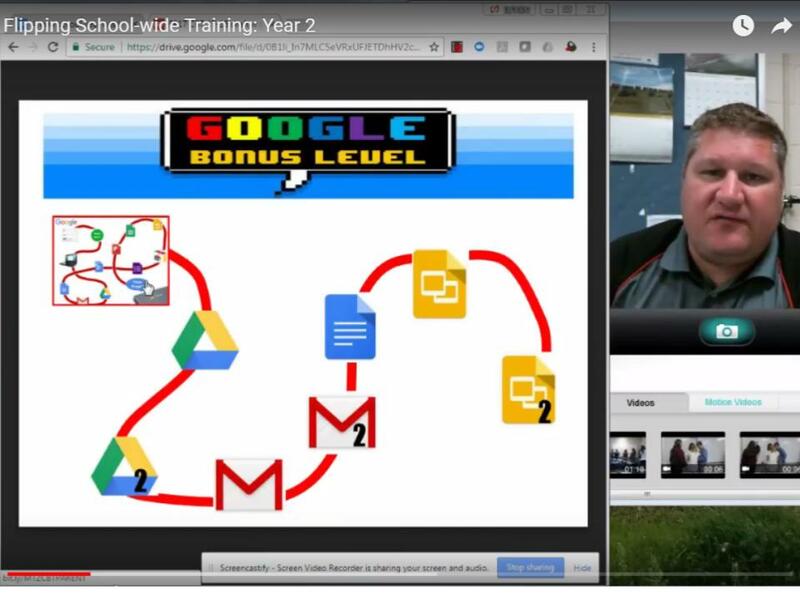 In the previous entries in this series, written last year, about the creation trials, travails, successes, and failures of the flipped learning training we used for acclimating both parents and students to the Chromebooks, I detailed our winding journey. You can access that journey here: Part 1, Part 2, Part 3, and Part 4. Want the Part 5 Vlog Update rather than reading click here! This entry is an addendum based on how we implemented training for this year. Since every student in 7th through 12th grade had already completed Chromebook training last year, that meant only the sixth graders needed the full training again. However, many teachers, particularly the high school, decided that some additional training and specifics were needed moving forward with Chromebooks to get more use out of them, and to address issues that it came up last year as students use the Chromebooks in the classroom. Not shockingly, we turned to a similar format to be used in our 25 minute “focus period” and RtI time that we utilized last year for the full training in this school-wide initiative. Staff was asked to suggest ideas, topics, or special components of a particular Google app that needed attention. The Principal suggested that we have students download a number of shared documents to specific folders within each students Google Drive things like the Chromebook Usage Policy and Rules, the Student Handbook, the Course Handbook, and other items of importance. A number of teachers and the Technology Director suggested that we have students create folders and an organization system that would be common to all students. We had them organize last year’s materials on their Google Drive by moving them into one area, while creating a filing system for students to use for this year for each class. The goal was a system that teachers could utilize to help students stay organized all year. Still other teachers suggested that we create labels and an organization system that could be universal across the building for students email, including teacher emails, so that it would be easier for students to file correspondence. We also had students create a contact list to contact teachers either individually, or as a group, for absent work, announcements, or other items that needed to be communicated. Finally, it was requested that now that students had some experience using slides that we begin looking more about form and finer points of how to communicate with the program rather than simple usage or menus. Students were given a short instructional video for each topic they were to watch in the Focus Period with this time functioning as an “in-flip” classroom. After watching the video, students worked on a task that related directly back to the content in the video with the teacher there in the group space to assist them. When they finished the tasks they were too conference with the teacher for suggestions and verification that the tasks were completed. While some may say “Isn’t this just online learning?” the answer is “yes”. However, it’s also flip with the individual space being the time students listen to the videos via their headphones. The fact that that individual space happens within the physical classroom of a group space is irrelevant to the process because they can join the group space whenever they choose, have trouble, or are called together by the teacher. This is my definition of the in-flip classroom. Click Here for the training map and then choose an area to explore. There was no large reward system setup for this particular one week training as Chromebooks are no longer new and the time frame for the training was significantly shorter being able to use the Chromebooks and the associated applications are now a universal expectation. This was the beauty of using flipped learning both last year and this year, allowing for a base level of universal instruction. Using flipped learning for universal training also lowered concerns from both teachers and students about a new process and technology, while allowing students and teachers to vary methods of assessment or interaction based on their level of comfort. Having established the framework and the methodology last year this year was a simple expectation and required little notice and no extenuating circumstances to accomplish.